We, the students of English (FYBA), are pleased to bring out this newsletter covering the activities and achievements of the GJCians i.e. the students and staff members of GJC. This activity is one of the student centered activities of English Department whose one objective is to groom future media persons like reporters, editors, photographers, newsreaders, etc. So, after this printed issue we are also bringing in our audio-visual news bulletin very soon. We are very grateful to Hon. Prin. Dr. R.H.Kamble, Vice-Principal Dr. Chitra Goswami and Librarian i/c Mr. Utpal Wakade. Without their support and contribution this newsletter would have not seen the light of the day. You can read this newsletter also online on our college website with the link thegjcians.blogspot.in . The publication ceremony of the book “ Marathyanchya Itihasatil Chimajiappache Yogadan “ by Dr. R.H.Kamble , the Principal in-charge of Gogate Jogalekar College, took place on last Sunday (Oct 3, 2016) at Bharat Itihas Samshodhan Mandal , Pune. It was released by the auspicious hands of Mr. Udaysing Peshava , with the renowned speaker and historian Dr. Raja Dixit in the chair and Dr. Mahesh Tendulkar as the special speaker. . The significant volume is actually the Ph.D thesis of Dr. R.H.Kamble. 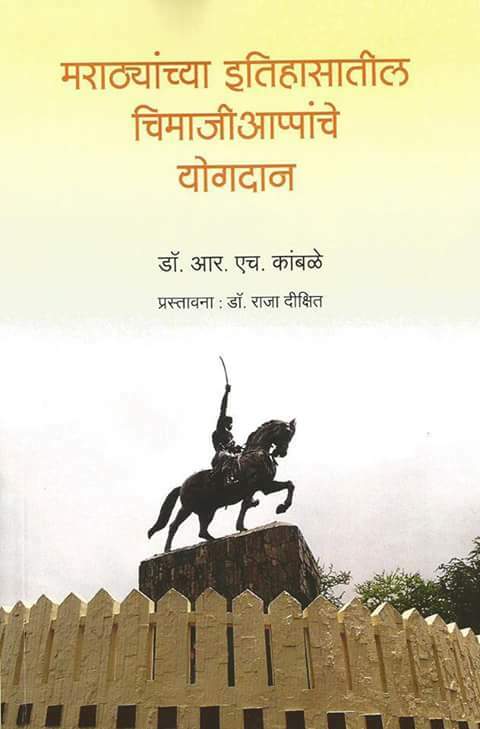 His research observes that the contribution or greatness of Chimajiappa as a skillful warrior and executor of the martial plans remained overshadowed because of the popularity of Bajirao Peshwa. Dr.Kamble’s book has brought to light that side of Chimajiappa who unfolds before us as a very brave and skillful warrior who could accomplish several missions that may be called ‘ Surgical Strikes ‘. This is the second book of Dr.Ramesh Kamble published this year. 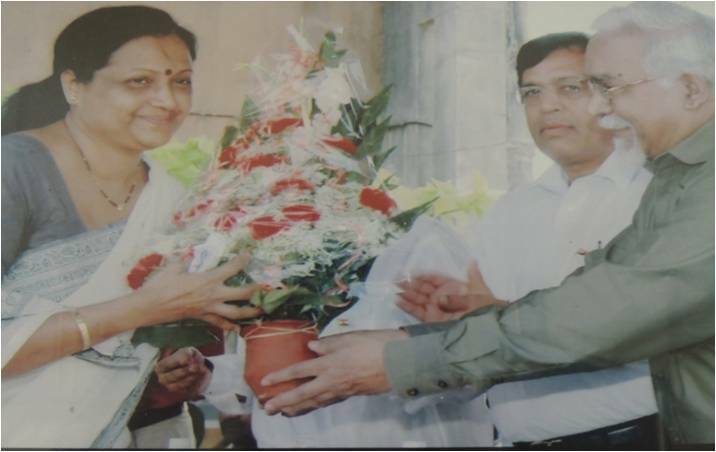 Prof. Mrs. Shraddha Rane , the Head of Marathi Department of the College, retired on 30th Sept.2016 after her long and dedicated service of over three decades. Mrs. Rane, who had also been a student of this college in early 80s, joined as a lecturer in Marathi and afterwards worked in many capacities like HoD, Convener of Literary Association, Convener of WDC, NSS Programme Officer, Vice Principal of Arts Faculty, Head of Post Graduate Section of Arts and the Chairman of Life Member Board of R E Society. 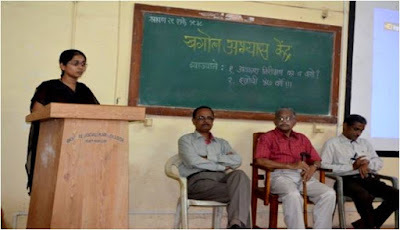 As a sincere teacher popular among her students she had also been awarded with Guruvarya A.A.Desai Puraskar ,R.E.Society’s Best Teacher Award and the Best Teacher Award of University of Mumbai in 2006. After Prof. Rane, Prof. Shivaraj Gopale has taken up as the new head of the Department of Marathi. Dr. Chitra Goswami , VP Arts, along with other language teachers congratulated him on the occasion. For the second consecutive year , the students of Geography Dept. 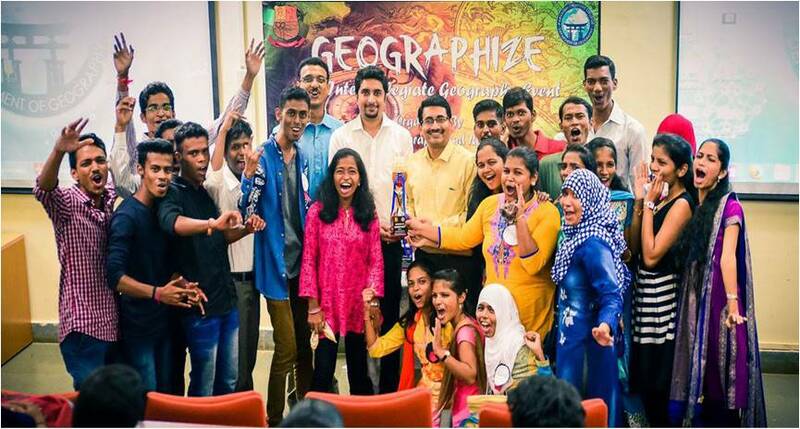 of GJC brought victory as runner-ups in “GEOGRAPHIZE”, the innovative inter-state level Geography festival organised by Parwatibai Chaugule College, Madgaon, Goa on 2nd September 2016. The 24 students of F.Y, S.Y,T.Y.B.A classes of GJC who participated in 7 events such as Quiz, Poster presentation, model presentation, comet, shooting star, power point presentation and skit ,won 2 golds ,1silver and 1 bronze medal.Nupur Mulye and Hrishikesh Lanjekar won Gold medal in Shooting Star (Short film making) while Taiba Borkar won her Gold in Comet competition. Model Presentation got silver and Skit got Bronze . Dr.Surendra Thakurdesai and Prof. Shrivallabh Sathe guided all these students. 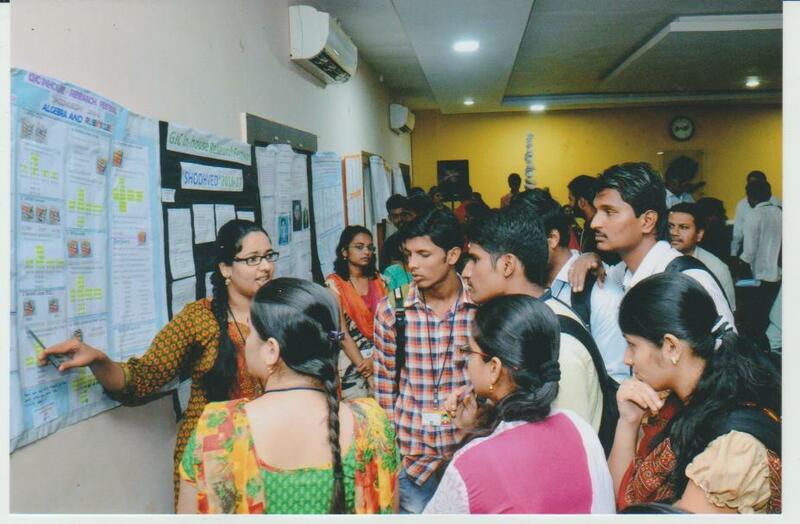 Total 17colleges & more than 300 students from Maharashtra, Karnataka, & Goa had participated in this geography festival. The host collage and the GJC have signed an MoU and the present activity was a part of sharing under the same. The GJC Film club was inaugurated on 29th September 2016 at Radhabhabai Shetye Sabhagruh. 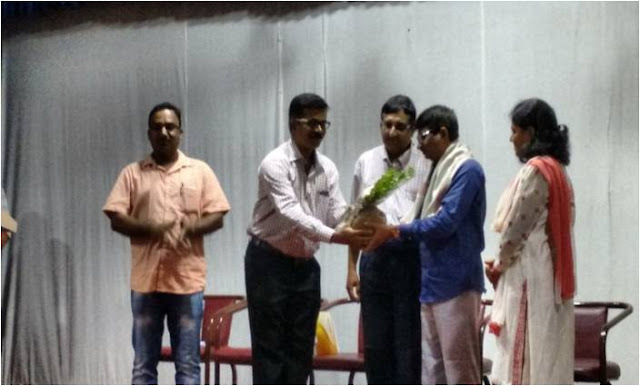 On this occasion, Dr. Nitin Chavhan, president of Ratnagiri Film Society and Dr. Shashank Patil, a well-known director were invited as the chief guests. The popular Marathi film ‘Sairat’ was screened as the curtain-raiser. On this occasion Principle incharge Dr. Makarand Sakhalkar , vice principle of Arts faculty Dr. Chitra Goswami, convener of GJC Film Club Prof. D. S. Kamble were present. Prof. Tejas Bhosale anchored the programme. ‘Education though entertainment’ is the main aim of the Film Club. This is really a unique activity which explains how we should look at films. 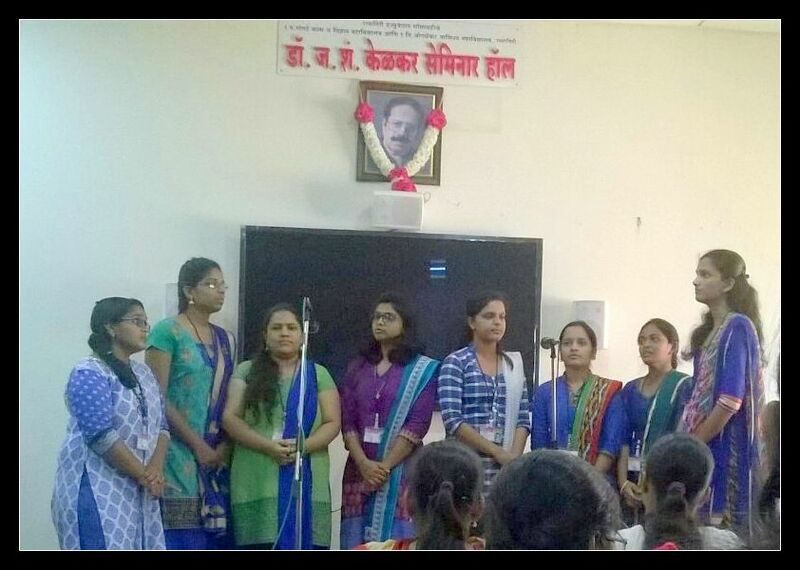 Gogate Jogalekar College participated in ‘Pratibha Sangam Sahitya Sammelan’ held by Akhil Bhartiya Vidyarthi Parishad in Nashik in the last week of September. There were 445 participants from all over Maharashtra among which total 6 GJCians viz. Vijay Bilur , Akshay Chavan , Shardul Ranade , Pratibha Kadam , Asmita Wadekar and Renuka Rahate participated . Vijay Sutar , another GJCian , was a member of the core committee of the prestigious event. Gogate Jogalekar College won the first prize for its annual magazine ‘Sahakar’ and Abhyankar Kulkarni junior college also won the second prize for its annual magazine ‘Sahakar’. Vijay Bilur, a student of M.A. 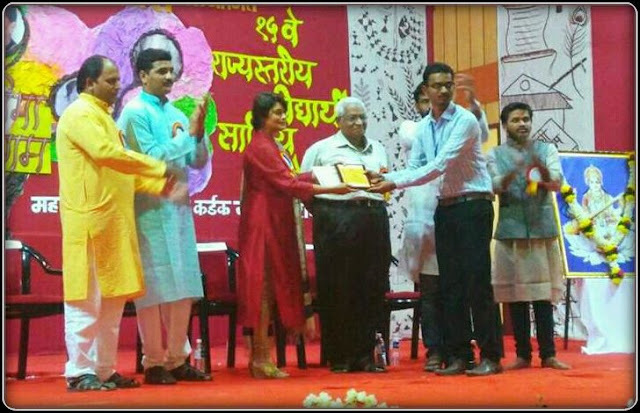 ( Marathi) was given second prize for his article ‘Lamani’. Pratibha Sangam Sahitya Sammelan has been playing a vital role for the publicity and development of Marathi literature for last 15 years. It is a great platform for many budding student poets and authors. This year it was held in Nashik (Vamandada Kardak Nagri) in the memory of Kusumagraj , a ‘Dnyanpeeth Awardee’ , for his contribution to Marathi literature. ‘National Sanskrit Education Centre’ has started a scheme for Sanskrit lovers in which there will be ‘Informal Sanskrit Education Centres’ and Gogate Jogalekar College has now got one such approved centre which was inaugurated on 1st September 2016 by the auspicious hands of Dr. Raghuveer Bhide and Prin. Dr..R.H.Kamble. 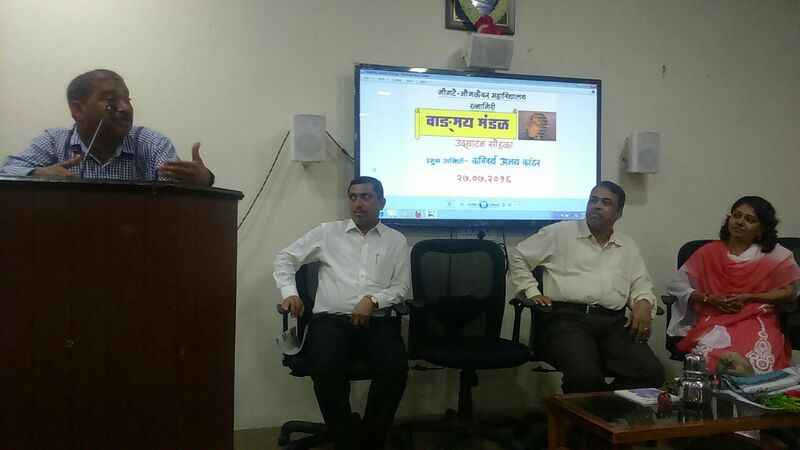 The Chief Guest Dr. Bhide said that we should know importance of Sanskrit. Origin of science and math is in Sanskrit. So Sanskrit study is very important. Shodh Vedh, the inhouse Research Convention 2016 , got an overwhelming response with 42 contestant teams with about 150 UG and PG students from all the faculties participating in it. The Science faculty participated with its 26 projects. The contested made poster presentations and answered the questions asked by the judges .There were 7 external and 7 internal judges. The main feature of the competition this year was the participation of 5 other colleges with MoU. They include Rosary College ,Goa; Govt.Collge, Sakhali ,Goa; Walchand Collge, Solapur; New Education Society's Management Institute ,Chiplun and DBJ College ,Chiplun. The college conducts this innovative activity to promote research culture among the students and to prepare them for the forthcoming University and State level research convention 'Avishkar'. This was the 7th year of ShodVedh. Prof. Uday Bodas ,the co-coordinator, with his other team members made the event a great success. Department of Physics of Gogate Jogalekar College, Ratnagiri has formed ‘The Astro Club’. 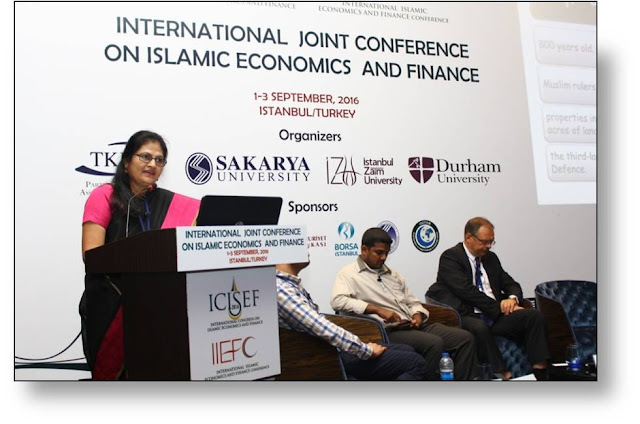 On 20th of August 2016 , the programme was inaugurated by the former principal of the college Prof. A.L. Jade. Dr. Kishor sukhatankar ,the Head of Physics Department, and Dr. Mahesh Belekar a senior lecturer of the department were also present on the dais. This session included two lectures on topics : ‘What is the need of sky observations and how?’ and ‘43 years of ISRO’ The former lecture was conducted by Mr. Saurabh Athavale while the other one was presented by Mr. Ninad Chindarkar, both MSc. students of the College. On 20th of September, the Astro Club arranged two more lectures on ‘Indian National Solar Calendar’ and ‘The Co-ordinate System’. delivered by Prof. Bhide. Miss Ruchita anchored the programme. For the first time in the history of University Level Competition , Priya Pednekar of GJC snatched the gold medal in elocution -B group [ language other than Marathi ] in the 49th Youth Festival of Mumbai University. She spoke in Hindi on the topic -‘Trustworthiness of Media’.The competition took place in ‘Vidyapeeth Viddyarthi Bhawan’ on 24th August,2016 and there were, in all, 28 participants who had qualified respective zonal level competitions. 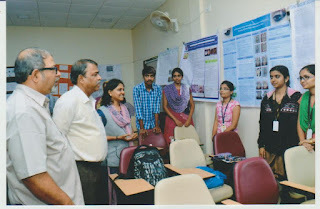 Prof. Jyant Abhyankar, Prof. Atul Pitre and Prof. Madhura Athavle guided her. Priya is a student of TYBA and majoring in English. 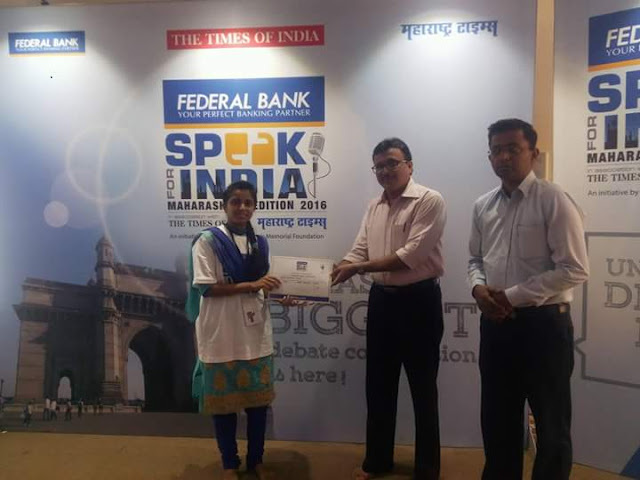 Also, she has been selected for the zonal level of the debate competition ‘Speak for India’ organised by the Times Group and Fedaral bank. She has also anchored a number of programmes . “Keep your curiosity and humanity alive. It is very important to understand basic knowledge of any subject. I experienced many great things from the world but still I am a student and so I am still down to earth”, said Mr. Achyut Godbole in his open interview. The interview was held on August 13, 2016 in ‘Radhabai Shetye’ auditorium and was a part of the programme ‘Lekhak Aaplya Bhetila’ under the ‘Vachu Anande Activity’ of R.E.society. Mr. Achyut Godbole was interviewed by Prof. D.R.Walawalkar and Dr. Nidhi Patwardhan of GJC. While responding to the questions, Mr. Achyut Godbole unfolded peaks and troughs in his life. He gratefully mentioned that his friend circle in IIT played very important role in his life. He explained how our brain is a great mathematician. Also he told students to find happiness from knowledge and to think differently from others. ‘Vachu Anande’ activity often arranges such programmes for students in order to connect them with reading, to inspire them to write and to give them opportunity to meet great writers or poets.The speciality of this programme was informal atmosphere. Students gave great response to this programme and enjoyed it a lot. Chairman of R.E. society Adv.Vilas Patne, Principal in-charge Dr. R.H. Kamble ,Vice- principal of Arts Dr. Chitra Goswami and professors from different departments of the college were also present on the occasion. 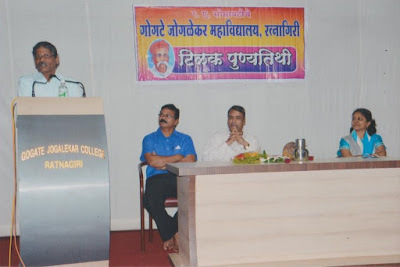 Lokmanya Tilak’s Death Anniversary was observed in Gogate Jogalekar College, Ratnagiri on 1st August.The programme took place in Radhabai Shetye Sabhagruh of the college. The chief guest of this program was Mr. Rajendraprasad Masurkar, a well known editor and translator of biographies who delivered a speech on the biography of Lokmanya Tilak written by Dr. Dhananjay Keer .Principal Dr. R.H. Kamble ,Vice Principal Dr.Chitra Goswami, and the convener of the Function Committee. Dr. Shahu Madhale were other persons on the dais . As usual, the Sanskrit Day was celebrated by the Sanskrit Department on 20th August 2016. The program was organized in the presence of Mr. H.R. Vishwas as the chief guest who observed that by being an ancient and a profound language, Sanskrit can also become a ‘Mother Tongue’. On this occasion, Dr. R.H. Kamble, the in-charge principal of the College guided the students saying , “Students should learn more and more languages along with Sanskrit and also they should have knowledge of some other languages as it is beneficial for personality development”. The Vice Principal of Arts faculty Dr. Chitra Goswami pointed out the correlation of Hindi and Sanskrit and other languages. 'Sanskrit literature, especially the Vedas and Upanishadas are the light-houses which guide us throughout our life' , she added. ‘Marathi Literary Association’ group was ranked first for group song ‘Bharata Swantatryadayak Mantra Vande Mataram’ presented in the annual Patriotic Group Song Competition held as a part of Independence Day Celebrations. Overall 8 groups had participated in this event from all over the college. The 2nd prize went to ‘ NSS Vakratunda’, while the 3rd one was won by the group ‘Swarapaulkhuna’ . The first three award winning groups also got an opportunity to perform their songs on the occasion of Independence Day. The inauguration ceremony of ‘Literary Association 2016-17 ’ was organized on 27th July. Mr. Ajay Kandar , a well known Marathi poet from Sindhudurg district ,was the chief guest . Mr Ajay Kander presented some of his famous poems like ‘ Baya Panyashich Boltat’. He unfolded how a poem is brought to life and how it is connected with everyone’s life. He also shared his experiences about his own books ‘Hatti Ilo’ and ‘Aavanol ‘. He told the students that the success is not measured in terms of awards you get but it depends on how many people read what you write . He also told that poetry teaches us to look at the world generously and impartially. The programme was anchored by Nivedita Koparkar, while the presidential address was given by principal Dr. R.H.Kamble. Dr. Niddhe Patwardhan expressed vote of thanks in the closing session. 'Nibandh te Shodhnibandh’ workshop was organized in the college on Saturday 30th July 2016. Dr. Vidyadhar Karandikar from Sindhudurg district was the resource person for the workshop. The introductory speech was delivered by Prof. Mrs.Athalye, HoD, Sanskrit Dept. Then Dr. Karandikar, a dentist by profession but a literary artist and researcher by vocation , explained the difference between an essay and a thesis. “An essay is based on imagination, while a thesis is based on a hypothesis. While an essay demonstrates emotional stability, thesis demonstrates otherwise, as it is based on hypothesis. Research is based on both, an essay and a thesis. Research has a long tradition from ancient times of Kanad to modern times of Dr. Kalam.” he said . We received the sad news of the sudden and untimely demise of Dr. Vidyadhar Karandikar , the scholarly resource person who had guided several GJC students over the last decade .He died of a massive heart attack on Saturday, 1st October 2016. We all GJCians are deeply saddened by his passing away and express our sincere condolences to his family. May his soul rest in peace. The post-admission welcome and counseling programme popularly known as the 'Principal's Address' was arranged on 13th July, 2016 for students of FYBA, at Radhabai Shetye Hall. The anchoring was done by Dr. Chitra Goswami, the Vice-Principal of Arts faculty. Principle in-charge Dr. Ramesh Kamble welcomed the new students and explained various college activities and infrastructure facilities .Dr. Goswami also explained all rules and regulations of college including the dress code . The heads of various co-curricular and extra-curricular activities introduced themselves and the activities which are held by their respective department. Dr. Yasmin Aowte, the Coordinator of Cultural Dept. informed the students about various activities and events of cultural department. NCC Department head Prof. Arun Yadav also gave information about various camps which are held by NCC department throughout the year. He also told the students about the benefits of joining NCC. Sonali Kadam, head of NSS department informed students about various national as well as regional camps which are held by NSS Department. Head of Mountaineering Club, Prof. Shrivallabh Sathe informed students about various activities of the department. Head of WDC, Dr. Kalpana Athalye explained various facilities and opportunities for girl students of this college. Two GJCians Declared Rastrapati Award in Scout-Guide. Two students of Gogte Jogalekar College viz. Padmaja Ambiye and Ankita Bandekar have been declared Rashtrapati Award in Scout -Guide 2015 as per the lists of Rashtrapti Awards declared on 22nd July 2016. The National scout-guide camp was held in Pune on 23rd Nov 2015. This was the second session in which 120 students from various states like Maharashtra, Gujarat, Madhya Pradesh had participated. The main motive of taking this camp was to understand the whole background of Scout and Guide and bring Awareness about it. This exam consisted of written papers, physical exercises, First Aid and knots along with basic concept of Scout and Guide. The full camp was organized by The National Foundation of Scout and Guide. The two students awardees Padmaja Ambiye and Ankita Bandekar have previously secured Rajya Puraskar given in Mumbai, by the honorable Governor Mr. Rao. The Rastrapati Award will be given in the next year in New Delhi. The NSS Unit of the College formally inaugurated its activities for the year 2016-17 on 24th August 2016 .On this occasion, tree plantation was done at Jawahar Ground by Principal in-charge Dr.R.H.Kamble. The table programme of the inauguration took place in Radhabai Shetye Auditorium in presence of about 150 volunteers . The program commenced with the University song and the NSS song. NSS Programme Officer Dr. Sonali Kadam explained the outline of the program and mentioned the programmes and activities organised till date . Principal Dr. Kamble welcomed the new volunteers and guided them by stressing the point that volunteers should earn their grace marks through committed social service. He pointed out to the volunteers that they are the privileged few and they have to help the less fortunate people . He congratulated all the volunteers and wished them for their future . 7 teachers on contractual basis clear their State Eligibility Test recently. They are Mr. Avadhut Purohit (Physics) , Ms. Aadnya Shirgaonkar (Physics), Mr.Vijay Gurav (Chemistry) , Ms. Pawar (Chemistry) , Mr. Nitin Potdar (Biochemistry) , Mr. Pankaj Ghate ( History) and Mr. Nagale (Commerce). The Principal and respective Heads and VPs have congratulated them on their success. A nice effort by the students of FYBA. All students of the college must read it.